For all New York City has to offer, it's not normally regarded as a premiere outdoor recreation spot. And while the metropolis may be short on cliff faces to scale, a newly-opened bouldering facility in DUMBO offers visitors the chance to rock climb beneath the Brooklyn Bridge with the Manhattan skyline as their backdrop. As reported by City Lab, DUMBO Boulders is officially the largest outdoor bouldering gym in North America. The 12-foot high, stainless steel and fiberglass rock wall is large enough to fit up to 50 climbers at once, with room for an additional 300 on the ground beneath. Visitors to the facility don't need to have any previous experience to climb. After purchasing a $9 day pass (rental gear included), guests receive a brief orientation before they're let loose on the wall. And unlike traditional rock climbing, bouldering doesn't require any special equipment like harnesses or pulleys, which means anyone can climb with or without a partner. 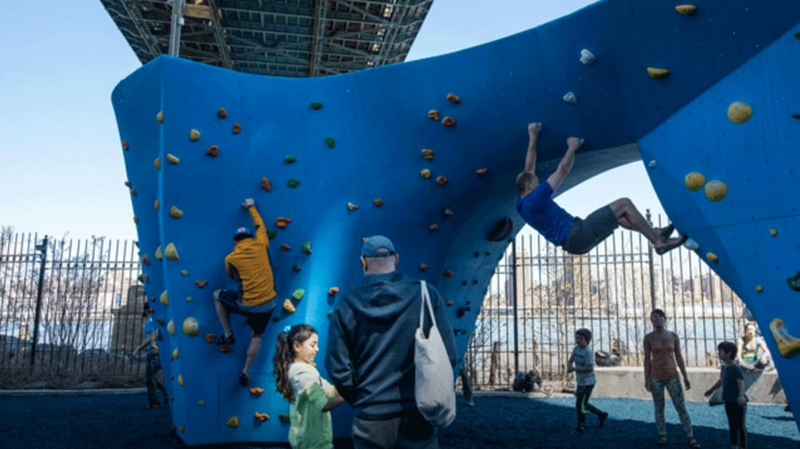 The new rock climbing space in Brooklyn Bridge Park is just one example of how cities are rethinking parks as investments in public health. The playground company KaBOOM! has constructed at least 53 "multigenerational playgrounds" in cities across the country, each with exercise equipment for park-goers of all ages. But even if you're not particularly fitness-minded, scaling a rock wall beneath the Brooklyn Bridge sounds like a day well spent. DUMBO Boulders is open seven days a week from now until November, when it will close for the season.